Being a Review of a Stage Adaptation of the novel The Lathe of Heaven by Ursula K. Le Guin. Adapted and Directed by Edward Einhorn. Performed by Untitled Theater Company #61 at the 3LD Art & Technology Center, New York, June 6-30, 2012. Photo Credits: Untitled Theater Company #61. Zhuangzi, the Taoist philosopher, had a wonderful dream about being a butterfly flitting about a meadow. Afterwards, though, he was struck by the existential quandary of wondering whether he were a man who had had a dream of being a butterfly or, instead, if he were a butterfly now asleep, dreaming it were a man. He is also somewhat known for discussing the consequences of going past the limits of understanding and thus being destroyed on the lathe of Heaven. It is an unfortunate translation, partly because lathes do not destroy, they shape, and partly because lathes did not exist in China during Zhuangzi’s lifetime. Edward Einhorn has shaped Ursula Le Guin’s novel into a stage production with live music and video imagery. It works, but in ways that are distinct from the novel. 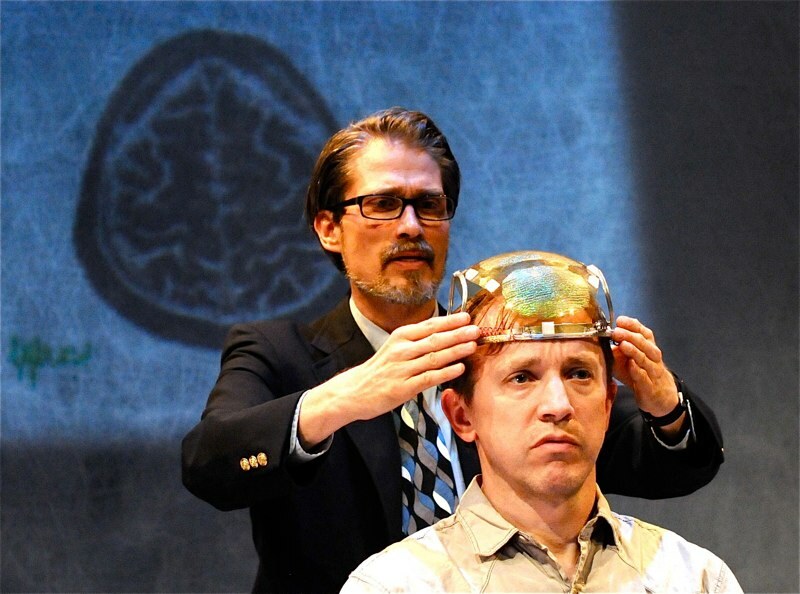 In both novel and play, George Orr seeks help from Dr. William Haber in stopping his vivid dreams. 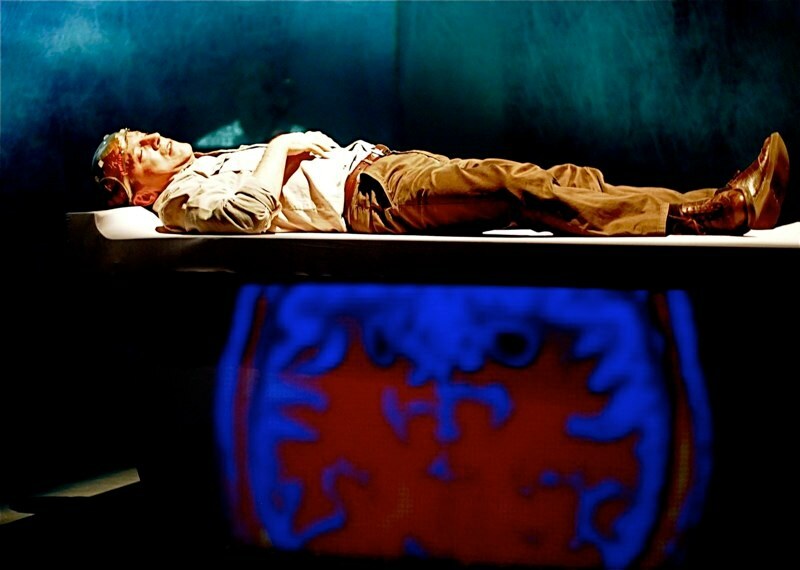 Orr calls these lucid dreams “effective” as they effect changes in the waking world, and he is wracked by guilt for what his unconscious does to reality. Haber sees the dreams as ways to promote the good life, if only Orr’s dreaming mind can be understood and thus controlled. Orr seeks help from Heather Lelache, a lawyer. She comes to believe Orr and tries to intervene in his dreaming. Aliens appear. Heather disappears, returns, disappears again. Orr confronts Haber. Haber, in turn, confronts Orr’s void, the butterfly-or-man abyss into which Orr has been staring. He is destroyed. Orr receives an alien blessing and the return of Heather. “Is this the best you could do for us—this mess?” Heather asks, surveying the (mostly balanced) world at the end of the story. “It’ll have to do,” Orr answers. Exeunt omnes. And, in fact, it does do. 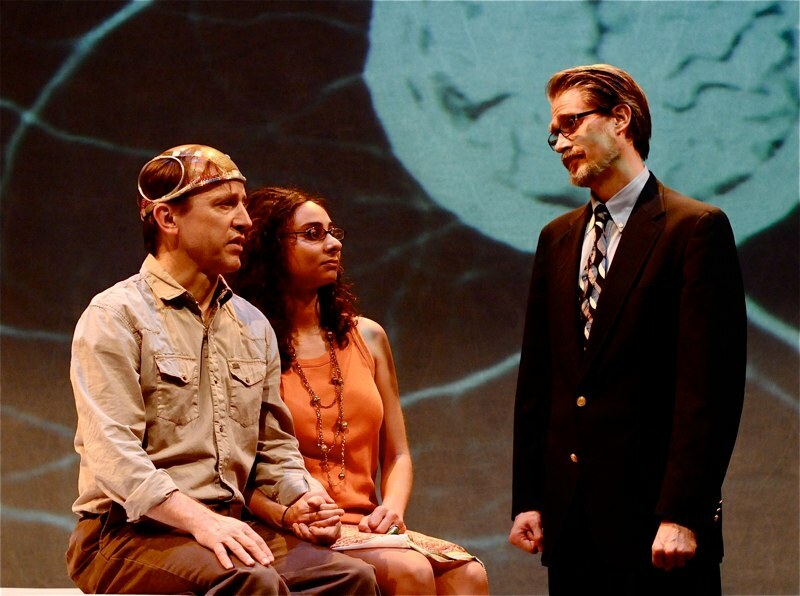 Einhorn’s play captures the essential elements of Le Guin’s book, shaving them down into very simple forms on a very simple stage that allows the central conflict between Orr (Robert Honeywell) and Haber (Eric Oleson) to stand out and to stand in contrast to the relationships of Orr with Heather (love) and Orr with Alien (teacher). 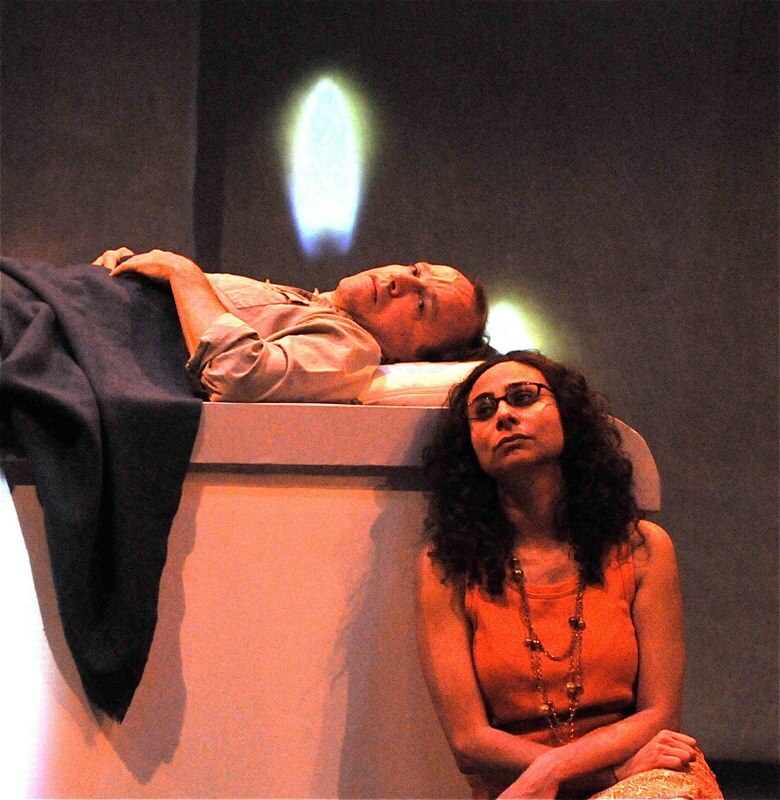 The play unites Orr and Haber, the only two who directly face the void, making them near-literal yin and yang figures (both characters are lying under sheets on the stylized white bier that represents Haber’s dream machine, the Augmentor, and crying for help, Orr at the opening of the play, Haber at the end, bodies aligned in opposite directions). And that unity is one of Le Guin’s major themes, that Orr and Haber are both essentially benevolent in outlook (“pro-life” as book Haber puts it; what a loaded term, now), only differing in means. Haber is the active man, the do-gooder; Orr is the passive man, the patient sufferer. Haber does cure Orr, even if he really means to negate him and steal the dreaming power for himself. The play may be less obvious in showing its audience that Haber experiences the same void as Orr, and stage Haber may be a less-threatening figure than book Haber (“white-toothed, bay-maned, huge, boomed out, ‘Good afternoon!’”). But he makes the same mistakes, paving his road to catatonia with bricks of good intentions, obliviously. Eric Oleson, by not dominating his scenes, wins more sympathy for stage Haber than a reader would give to book Haber, which works to further Le Guin’s point, that Haber is not evil but unbalanced. Lathes do a nice job in restoring balance. Heather Lelache (Carolin Samaan) also appears softer in the play than in the book, where the character is introduced with insectile metaphors as a spider with “her chitinous voice, clicking her mandibles”. (A bit harsh, even for a go-getter of a lawyer.) Here, Heather is less click-clacky, her heavy jewelry reduced to more contemporary professional garb. This is not the Seventies, and she is not the child of hippies. She is also not a child of an African-American father and European-American mother; here she is Egyptian and Lebanese, Christian and Muslim. Einhorn gives us a less charged character, one who struggles with differing legacies and parental differences, but not as emotionally or socially marked as book Heather. Removing the racial aspect reduces some of the distancing that Le Guin was attempting (it MUST be the future if African-Americans can casually be introduced as professionals), which is doubly ironic in the Age of Obama (the future is Now, we have a black President; and just where’s his birth certificate??). It is also problematic in that Heather’s mixed-race heritage is integral to her disappearance when George “solves” racial strife by making all humans grey. Le Guin cannot conceive of a Heather in a uni-tone world. Einhorn has Heather disappear, but I think that the audience saw that deletion as a side-effect that needed to be explained instead of a tragic necessity. In other ways, though, as the person who believes in George and becomes his quest-love, stage Heather fulfills our expectations. Ms. Samaan brings out the warm side of Heather, so we do miss her when she disappears, even if we are unsure why she was canceled from existence. With the Alien (John Gallop III), Einhorn exceeds book (and both movie adaptations, as well). Here, the production’s choices of trimming down combine neatly, as Gallop provides a strong operatic tenor voice for the musical numbers (often incorporating the Taoist verse of Zhuangzi) as well as portraying the various Alien visitors who first erupt as space menace (a result of Haber making Orr dream of “world peace” leading to war between worlds in place of just on this one) and then reveal as Dreamtime mentors when they come down to Earth (a result of Heather hypnotizing George to have a dream about the Aliens leaving the Moon). In the book, the Aliens, though seen individually, are collective in mind, so having one actor play all Aliens conveys their essential oneness. Plus, it is from an Alien that Orr learns to get by “With a Little Help from My Friends”, both through the gift of a Beatles record and by the Alien mantra “Er’ perrehnne”. The Alien is the source of the story’s music, and Einhorn brings in music via a performer who gradually changes from tuxedo to Alien turtle shell. Wisely, Einhorn has the Alien enunciate well, relying on the bits of Alien lingo (er’ perrehnne, and the untranslatable iahklu’—one who dreams effectively?) and gently fractured grammar rather than employ Alien speech patterns. (In the book, the Aliens address George Orr as “Jor Jor”, which now has unfortunate consonance with a Mr. Binks of Star Wars). Similarly, Einhorn skirts the abyss that claimed the famed 1980 PBS movie adaptation, using lyrics about help from friends without sampling the original Beatles song (which even the 20thanniversary PBS broadcast avoided, using a cover version instead). With the shift from soft rock to a more operatic and atonal score (composed by Henry Akona for cello and piano), the stage production conveys the more ethereal aspects of living in multiple dreams or worlds simultaneously. No caged pronunciations required. Which brings us to the last piece of the puzzle, George Orr. Here, the lathing of the play takes a curious turn. Where much else is stripped down (like the nicely bare set with Haber’s Augmentor reduced to classical curved couch and spangly Plexiglass helmet, delineated from the audience by a Zen rock garden and a single dandelion—tenacious root flower, Orr’s life anchor against the abyss—whose shadows could be stains left from a nuclear flash), Orr is not bare. Instead, stage Orr inhabits the chaos which book Orr struggles to contain, using it to fill out and fill up the otherwise open spaces of the production. Honeywell’s Orr is visibly, volubly wracked with worries and guilt. He channels all the hurt of the brave, newer worlds that Orr and Haber will into being. He becomes the voice of those worlds, taking in all the unexpressed and inexpressible pain of those who are suffering and, especially, those willed out of suffering, willed out of existence. It is hard for me to see how Honeywell could do otherwise, as all of Le Guin’s ancillary characters have been removed, and no other character could speak for them. Yes, Einhorn uses video to bring in the sense of a world in flux, particularly with a poignant, silent, frightening sight of a crowded downtown Portland melting away, building by building. Yet, we cannot hear the cries or sounds of those worlds as they morph; save for some concussive explosions of noise, they are mute. Book Orr can witness the cleaner, brighter, less war-torn worlds that Haber’s meddling makes, and experience their rites of involuntary euthanasia (by citizen’s arrest) and rise of organized blood sports, brutal control structures manifesting along with Haber’s rise to world leadership. Stage Orr must speak to them and for them, but in doing so, he cannot speak for himself. Orr’s gods were nameless and unenvious, asking neither worship nor obedience. “Yet I do say it,” he replied mildly. Stage Orr’s gods are much more thundering; they are gods of the vortex, the one that Orr bears, that he wishes to escape, that he wishes on no one, even on Haber, so eager to assume the thorny crown of dream divinity. Einhorn brings the contrast and connection of active Haber and passive Orr to the fore, again showing the linkage, quoting Le Guin, with Haber arguing that life/evolution/ existence is change, to which Orr replies, “That is one aspect of it. The other is stillness.” Stage Orr, encapsulating chaos, presents the argument but does not embody it. In the end, it still works. Einhorn and Untitled Theater Company No. 61 bring Le Guin’s work to the stage, adding and subtracting where needed, adapting it in a true sense, fitting it to the specific situation of 3LD Art and Tech Center with music and video. In the process, Einhorn has not destroyed it, but he has inverted our perception of it and given us a cut-out silhouette instead of a sculpture. Perhaps he was using a jigsaw instead of a lathe. A review well done for those of us who were unable to attend in person! Thank you for sharing this experience that others may chose to follow. You are welcome! I shall be posting another Le Guin stage adaptation review (The Hidden Sky, a music/dance piece inspired by her early short story, “The Masters”) shortly.